Instant communication methods such as email and texting make it very easy to send messages, documents and other files with just a couple of mouse clicks or finger taps. Even with these streamlined mechanisms available, there are still occasions where a hard-copy fax is required by the recipient. With the help of one of several third-party services available, you can actually send a fax right from your Gmail account – avoiding the need for a physical document and a fax machine. Once you've signed up for an online service that supports faxing by email, the next step is to compose and send your fax. It should be noted that most services do allow a certain number of faxes to be sent for free, but you may need to purchase credits, tokens or a subscription in order to fax from Gmail. These requirements typically vary from provider to provider. Also, the Gmail address that you plan on faxing from must be the same email address on file with your fax provider. If not, your transmission attempt will likely be rejected. Create a new email message in Gmail, either within the app or the browser-based interface, by clicking on or tapping the Compose button. Enter the recipient's fax number (including area code) in the To field, followed by the domain of your fax provider. For example, if you have an eFax account and you're sending a fax to 1-212-555-5555, you would enter the following: 12125555555@efaxsend.com. This domain value (in this case efaxsend.com) is specific to your individual fax service, so it's important that you verify its exact syntax before completing this step. You can now incorporate the contents of the actual fax, which need to be within an attached file. Multiple formats are supported including DOC, JPG, PDF and TXT, among others. Most fax services allow multiple attachments, the contents of which are often combined when the fax is sent. In a browser click on the Attach files button, represented by a paper clip and located towards the bottom of the New Message interface. If you're using the Gmail app instead, tap the paper clip icon found in the upper right-hand corner of the screen. 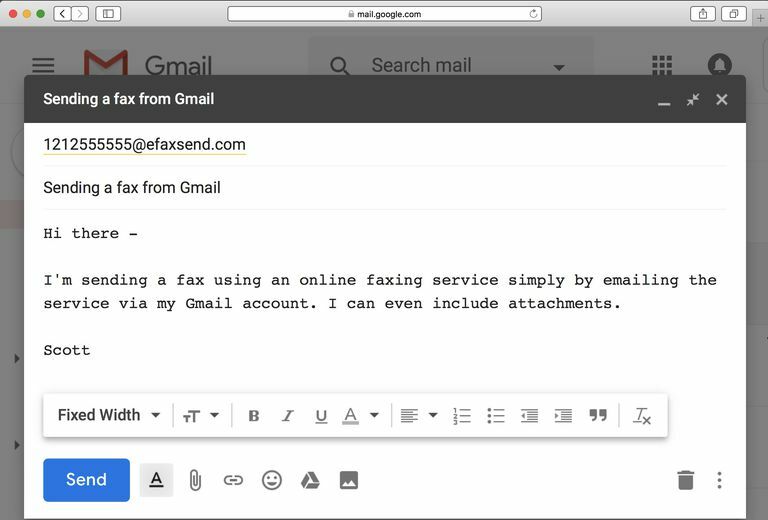 As with a traditional fax message, you can also include a cover letter when faxing from Gmail. Type the desired content for the cover letter in the message's body, just as if you were sending a standard email. Once you're satisfied with both your cover letter and attachment(s), hit the Send button. Your fax should be transmitted instantly, although the speed is somewhat dependent on the third-party provider. Confirmation of this fax transmission is typically available within your fax service's user interface.